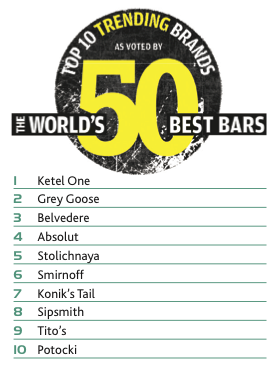 We are not surprised to see Ketel One at the top of the vodka pops. This is no doubt a love affair driven by bartenders and passed on to consumers. The love affair begins in Holland, where the Nolet family – also of Nolet jenever gin fame – have been distilling for more than 300 years. First the fermented grain is passed through a column still before a portion of it goes through copper pot stills – or Distilleerketel in Dutch. And the most famous still number? It’s Ketel One. You may also know that Ketel One is part of Diageo’s Reserve portfolio – it’s a 50/50 joint venture between the Nolet family and the global drinks giant. Let’s look at the others. The big stalwarts – Absolut, Smirnoff, Grey Goose and Belvedere – are all there, while the bottom end of the trending table takes us on a little journey of lesser-known brands. Konik’s Tail is a Polish vodka made from spelt, rye and winter wheat and, although it launched in the UK in 2010, it is set to launch in its home market of Poland this year. It’s a baby compared to the mighty Smirnoff. Konik’s Tail produces 4,000 nine-litres cases a year. At the last count, Smirnoff weighed in at 24.7 million. Then there’s Sipsmith. This small west London distillery has been making waves with bartenders since it started distilling in 2009. The master distiller is celebrated cocktail author Jared Brown and, although you would definitely describe the brand as boutique, it has curried big favour with the bar community. Tito’s Handmade Vodka is produced in Austin at Texas’s first and oldest legal distillery, according to the company. It’s made in small batches in a pot still by Tito Beveridge – yes that’s his actual name – and distilled six times. Potocki is a Polish vodka, made from rye, and it is named after the family who began making the spirit. After a double distillation, the vodka is left to rest for a few days before bottling. Interestingly it doesn’t undergo charcoal filtration. Since we relaunched the World’s 50 Best Bars, we think we’ve built up a pretty fantastic list of top bars and phenomenal bartenders from all over the world. It’s still growing, make no mistake – and we feel really quite excited about it. So excited in fact, that this year we decided to reinvent the way we conduct the artist formerly known as Hot Bar Brands by polling our very own top 50. 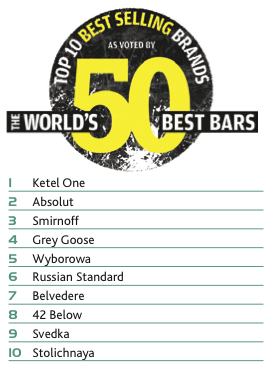 To create an even better global picture, we also polled 100 of the top 200 bars. When I say ‘we’, it was actually an independent research company called Leslie Henry Marketing & Research. Voices from the team at Leslie Henry could be heard through telephone receivers from Melbourne to Budapest, Edinburgh to Singapore. The team asked the top bars which brands were best-sellers and which were – to borrow from Twitter – trending. A trending brand might not be doing the same volumes as a best-seller but it’s a brand that customers are increasingly asking for. We also included a couple of new categories this year – champagne and water – as well as expanding the cocktail questions to include the likes of aperitifs and after-dinner drinks. The idea is to paint as accurate a picture of what is being consumed in bars around the world as possible. Respondents – to use the fancy terminology – included bar owners and bartenders from the likes of the best bar in the world, the Artesian, London; PDT, New York; Nightjar, London; Bramble, Edinburgh: Employees Only, New York; Dry Martini, Barcelona; Black Pearl, Melbourne; Asoka, Cape Town; American Bar at the Savoy, London; Tippling Club, Singapore; Palmer & Co, Sydney; Boutiq Bar, Budapest; Chainaya Tea & Cocktails, Russia and Schumann’s Bar, Munich.